Since our last update, Grace House kids have been busy with studies and activities now that school is in full swing. The school leadership, villager leaders, and Thai officials recently held an Opening Event and Awards Ceremony to recognize the top performing kids and importance of education. 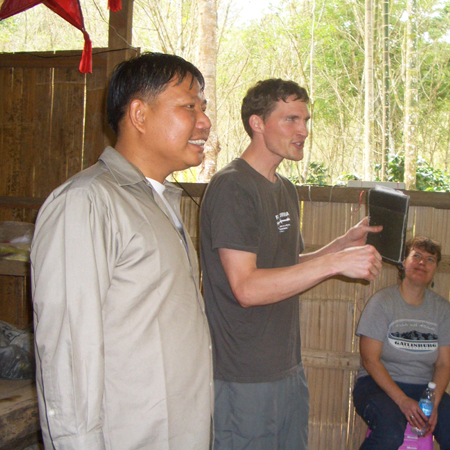 In June Freedom Harvest welcomed a team from New Hope Church to Mae Hong Son. Working with the local churches, the team had several opportunities for ministry including at Rak Thai, the local churches, the Thai vocational college, and the Karenni Bible School. A big part of the mission was to reach out to the many different groups with the gospel and to train up others through hands-on experience. They were also able to spend lots of time with the kids in the Long Neck village, both teaching in the school and at Grace House. The team said this was one of their best trips yet. Thank God for open doors and His gospel going forth! The LN village also had a team that’s connected with the MHS church and Tiff’s pastor. The team donated funds and helped build a mushroom house to provide sustainable income to the village and school. This is the second time they’ve come and generously given. UN also joined with local church members recently in an outreach to Karenni families in the refugee camp. We are thankful God provided a time to share the gospel with a few families and to be able to pray for their needs. Please keep lifting them up in prayer and for the seeds to bear fruit. The kids at Grace House are continuing to go through a special bible training course with the pastor from the local church. It’s been a blessing to have this opportunity with the church and for the kids to be trained up all the more in the ways of the Lord. Please be praying for more growth! The kids have also been doing lots of activities and in and around the village. Below are some of the daily chores of village life and ministry times at Grace House. Thank you again for your continued prayers and partnership in bringing the gospel to Thailand and Burma. God Bless you!